BOSTON (AP) — Donovan Mitchell was much more efficient leading Utah in scoring this time. 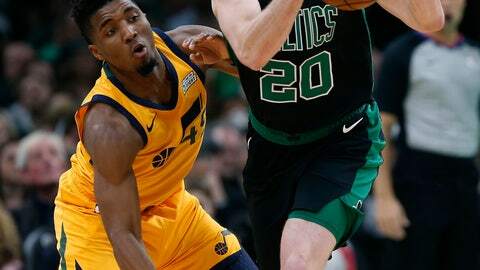 Mitchell had 28 points and six assists, bouncing back from one of his worst performances of the season and leading the Jazz to a 98-86 win over the Boston Celtics on Saturday night. “I didn’t really do too much but just being in the right spot and keeping my mind focused on the game plan,” said Mitchell, who also had three steals and made a big block as Utah pulled away in the fourth quarter. Although he scored 31 Friday night in Philadelphia, he made only 13 of 35 attempts and didn’t have an assist as the Jazz lost to the 76ers 113-107. Against Boston, he was 10 for 21 from the field and 3 for 4 at the free-throw line. Ricky Rubio scored 20 points for Utah, which beat Boston for the second time in eight days and swept the season series. Rudy Gobert had 12 points and nine rebounds, and Derrick Favors finished with 10 points and eight boards. Utah improved from 15 assists in Philadelphia to 23 against the Celtics. “We a lot of guys that can make shots, and when we move the ball, find the open man, we shoot with more confidence and they go in,” Gobert said. Boston scored its fewest points since a 93-90 loss at Orlando on Oct. 22. “We have to build a tougher team mindset than we have,” Celtics coach Brad Stevens said. Kyrie Irving had 20 points for the Celtics, who had won two in a row. Jayson Tatum finished with 10, but no other player scored in double figures for Boston. The Celtics were just 8 for 26 from the field in the third quarter. They had to play much of the period without Irving, who fouled Mitchell on a 3-pointer with 5:40 left. Mitchell made all three from the line to put Utah up 68-55, and then Irving picked up his fifth foul just 28 seconds later. Utah ended a two-game losing streak, which started with a 118-68 loss at Dallas on Wednesday. The Celtics were coming off a 123-116 overtime win against Toronto. After shooting 52.8 percent Friday against the Raptors, the Celtics struggled to make 35 of 91 shots against the Jazz and went 11 of 20 from the foul line. Stevens had seen enough and pulled most of his starters with about eight minutes left to play. In the second quarter, Irving caught Rubio on a crossover dribble, giving himself a wide-open look at a 3-pointer that got the Celtics within 49-45 with 33 seconds left in the half. There was a brief confrontation at midcourt that led to technical fouls on Boston’s Marcus Smart and Utah’s Joe Ingles. Jazz: Led 50-45 at halftime despite going 4 for 11 from the foul line in the first half. … Dante Exum had 10 points and seven rebounds. Celtics: Irving picked up his third foul with 2:59 left in the second quarter. Jazz: Close out a five-game trip at the Indiana Pacers on Monday night. Celtics: Visit the Charlotte Hornets on Monday night.